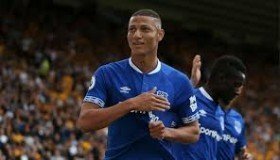 Chelsea have reportedly been told to part with a fee of £70m by Everton, if they are lure Richarlison to Stamford Bridge at the end of the season. The 21-year-old has already contributed 11 goals for the Toffees this campaign and this has doubled his tally from his debut Premier League season at Watford. According to The Star, Chelsea are currently keeping tabs on the attacker alongside several other elite clubs including Paris Saint-Germain, Atletico Madrid and AC Milan. However, they would still have to pay a significant fee for the Brazil international, given the Toffees are reluctant to sell unless his £70m valuation is met in full. Richarlison has witnessed a slight dip in form over the past month and he was most recently dropped to the bench for the Premier League defeat against Manchester City. Meanwhile, Chelsea have dropped from fourth to sixth on the table in the space of one gameweek after an embarrassing 6-0 defeat at the hands of Manchester City on Sunday. Man Utd boss Solskjaer quips "United in driving seat for top 4"